Just in time for Independence Day, Yonkers, New York-based auction house Cohasco is offering a piece of history dating from the early days of the founding of the United States. "According to the Library of Congress, about seventeen documents exist with dates of July 4, 1776, most relating to or signed by George Washington," said Cohasco owner Bob Snyder. "We have what we believe is one of the earliest known documents of the modern United States [dated July 4, 1776] that names a specific African-American." Perhaps of equal interest is that the item offers a glimpse of race relations in the United States over two hundred years ago. 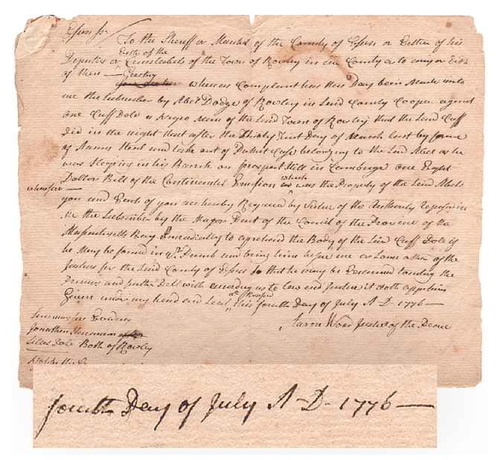 In something of an ironic coincidence that this arrest warrant bears the same official date Americans celebrate independence, a man named Cuffee Dole is accused of stealing "one Eight Dollar Bill of the Continental Emission" on March 31, 1776, from a soldier near George Washington's Cambridge headquarters. Ultimately, the paper trail runs cold as to what happened next in the case of Cuffee Dole, but historians believe the charges were dropped. like me akin to earth and worms." Now through July 24, this and over 400 other items are up for auction. Cohasco doesn't accept online budding, so interested parties must either call in their bids 1-914-476-8500 or email info@cohascodpc.com.